We are having a community celebration next week. If you are around, please come! De belles surprises pour mon party de 60e anniversaire hier soir, avec ambiance rockabilly signée The Black Moon Boys. 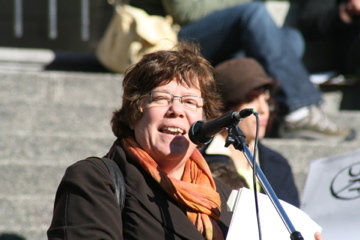 Grand merci à tous ceux et celles qui sont venus faire un tour, dont Libby Davies, chef adjointe du NPD et députée sortante de Vancouver-Est. Thank you Columbia U students for your initiative to oppose dreadful prisons and the mega private business it generates. How often did I hear Jack say: "Don't let them tell you it can't be done." And now here we are. Thinking of Jack today. Here is a piece I wrote for rabble.ca. Day one and Harper begins with incorrect info....this super long campaign won't cost the public purse extra? So not true. Hope everyone is ready for this marathon. We have an historic opportunity to bring about change in Canada. Time to rid ourselves of a negative, cynical, harmful government, and elect New Democracts led by Thomas Mulcair as Prime Minister. It IS possible. Getting ready to celebrate Libby Davies with the BC Forum table. Our political parties are different, but I still respected Flora McDonald and was sad to hear that she died. I met her a few times, over the years, and know that she was someone who was forthright, diligent, substantive, and very strong female politician, when many barriers existed for women. Make sure you're registered to vote for this important election to remove the most Conservative government in Canadian history. A very hot sunny day here in Vancouver for Canada Day. I got my sun hat on as I head out to community events - hope to see lots of folks and kids celebrating at Hastings Park, Britannia, and Kingsgate Mall. I have Canada pins, flags, and cool east van shopping bags galore! June 2, 1997 - election day - and I couldn't believe I was the new MP for the great Riding of Vancouver East. Now 18 years later - I still can't believe my good fortune to have run in 6 elections to represent the best riding in Canada! Thankyou to all the good folks who voted, have been active, inspiring, and strong. Here's to you! I don't think I can sleep tonight....brimming with excitement over Alberta election and stunning victory of @rachelnotely and the Alberta NDP. She inspired people to vote for real change that defeated tired old politics and the belief (peddled by mainstream media) that only the Cons can govern in Alberta. Thank you Albertans for your strong stand for change and a clear vision for the future. A fabulous evening with the wonderful Libby Davies. Big thank- you to all of our supporters for coming out! Conservative MPs get a surprise delivery of toxic debris from Vancouver oil spill. I arrived back in Vancouver from Vietnam,and the Parliamentary conference I attended, to cherry blossoms, ahh, so beautiful......but an oil spill in English Bay, washing the shores in sludge? This is terrible.....and makes everyone all the more concerned about increased tanker traffic on the north and south coasts. I see on the news that the so called "response" was slow and not coordinated. And the Coast Guard and Feds?? This will need to be raised in Ottawa next week when Parliament resumes. Presenting the report from our HIV/AIDS Advisory Committee at the Inter Parliamentary Union in Hanoi. An amazing city, with millions (literally) of motor bikes and scooters that transverse the streets with wonderful calm and a zen like quality. Crossing the street is quite a challenge though! Had some emails and social media asking why I wasn't at vote in House of Commons on extending/expanding Canadas military involvement in Syria. Here's why: I am attending the 132nd Inter Parliamentary Union general assembly (its like the UN for Parliamentarians). I chair the Advisory Group on HIV/AIDS and child Maternal Health. We have a small all party delegation from Canada. Our continuing work in the IPU is important so unfortunately this time it meant being away from H of C this week. Of course, had I been there I would have stood with my colleagues in the NDP to oppose the Cons motion. Hello Sisters! Happy IWD around the world! In our diversity we seek solidarity; in our strength we seek justice; and in our memory we remember the sisters who have fallen. We demand decent wages, freedom from discrimination and violence and a better world that respects women for who they are, where they are. Much to celebrate, and share, much to do. Parliament voting on 2nd R of Bill C51 : this far reaching anti terrorism legislation has barely been debated - but is rushed through nevertheless. I suspect that in due course more Canadians will realize how bad this Bill is and will understand how it impacts the liberties of all Canadians. Is this a reason why the Conservatives want to get it out of the way so fast - before people can absorb the full impact of it! Very disappointing that the Liberals have voted for this legislation; but proud the NDP and Green have stood firm - substantive opposition. I am really proud that the NDP is standing strong to oppose Bill C-51 that contains sweeping powers that affect the freedoms of all Canadians. Make no mistake - this Bill is bad legislation. Public safety is always a priority, but giving CSIS broad new powers without oversight is wrong. RCMP should not be in charge of Parliament Hill security. Glad to see NDP Whip, Nycole Turmel, bring forward counter-proposal to the government’s ill-considered motion. This sets a bad precedent. Landmark #SCC decision re #medicallyassisteddying; thankyou @bccla and @DWDCanada. Parliament must act! A detailed account and analysis of "Black Flag: The legal and moral implications of the policy of attacking residential buildings in the Gaza Strip, summer 2014" just recently released by B'Tselem - The Israeli Information Center for Human Rights in the Occupied Territories.